So last Saturday Ivy and I got up early and drove an hour and a half or so to a flea market. It was called the Picker's Paradise,and was supposed to be HUGE. I say, 'supposed to be'. It wasn't nearly as big as the ones Lori and I go to. I don't know if it was just not full this year because of the weather,or if the advertising exaggerated. When I say the weather,I'm referring to the rain we had nearly every day for three weeks. The sky was black and practically every day it rained on and off,if not all day. Even though the flea market was quite a way from here,the rain was there too. We got rained on on the way there, and once there the flea market was deluged with rain. Most people covered their stuff up to protect it, so there wasn't much to look at. The buildings were so crowded with people who were just tramping around in a circle,not even looking at anything, that those of us who wanted to look at the stuff couldn't. The ground was nothing but deep puddles and mud. Ivy wore boots,so she was ok. I don't own any boots except a pair of pale gray faux suede ankle boots I bought for winter. So my feet were soaked and my shoes were covered with mud. When we tried to leave, much earlier than I would have thought,we got stuck in the parking lot and had to be pulled out by the flea market bulldozer. But back to what I found. I went around the flea market for ages before I found anything. We did pass a table that was covered that I could see boxed Barbie's peeking out from. I said to Ivy that we'd try to come back when the rain had stopped, but I doubted we'd find it again. As it turned out,the place wasn't so big that we didn't find ourselves back there eventually. But the first thing I found,(Finally! ), was this. Isn't it cute? It's an actual Radio Flyer mini tricycle. It's the perfect size for 18" dolls. I have a wheel problem. My front wheel needs turned around, but it's stuck. I got some more little 1/6 scale vases at the flea market. There were ten of them,but I was able to buy just the six I like. One of these days I am going to put together that 1/6 scale antique store,and all my tiny vases and plant pots will come into use. We did eventually come back around to the lady with the Barbies again. The rain had stopped by then,so she had uncovered her stuff. She had some pretty good prices. Her stuff had the original clothes and accessories,but most of the boxes were damaged or dusty. I don't care much about the boxes anyway. I bought a very pretty 'big eye' Skipper. She was from a line of dolls that had little Reebok covers for their shoes, to make them look like Reebok sneakers.The 'Cool Tops' must be all those shirts she's wearing. It's way too hot for that many shirts! The same lady also had some older stuffed toys in a basket. The poor things had been soaked in the rain. I found this girl buried in the bottom of the basket. She's a Fisher Price Lap Sitter doll named Audrey. She needs her hair done. She was made in 1973. 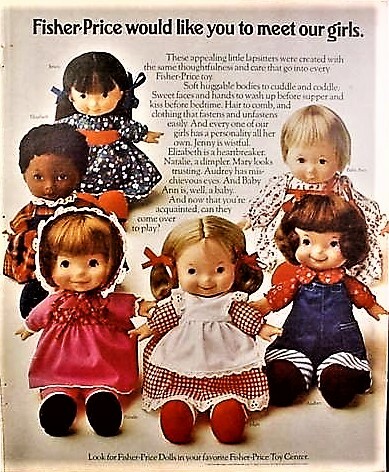 The Lap Sitters were a series of soft bodied dolls with vinyl heads and hands,and some removable,and some made-to-their-body clothes. Audrey has removable bibbed overalls. You may have seen my Lap Sitter Joey in his Doll-A-Day post. The only other thing I bought at the flea market,(besides the funnel cake with strawberries and whipped cream,that Ivy and I split. ),was one vintage hanky. 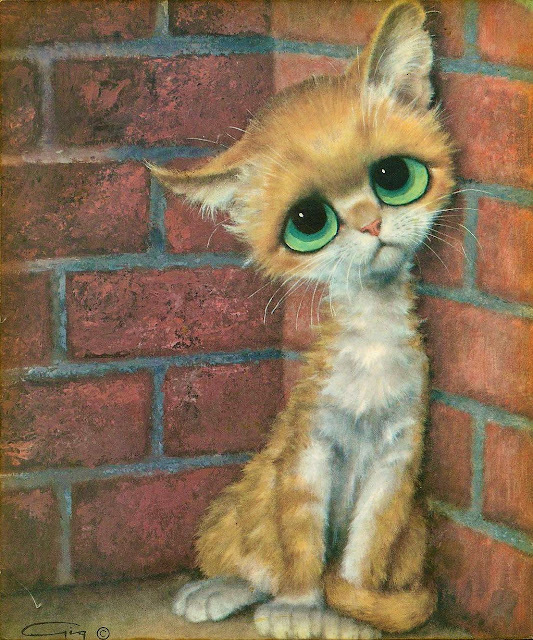 I was tempted by a plastic version of the Pity Kitty paintings by Gig that I loved s a kid. It had it's original hang tag and old piece of rope around it's neck. Like this picture I had in my room growing up. I wish I had bought it actually. After we left the flea market and been towed out of the mud to the exit by the bulldozer,we decided to try for the nearest Toys R Us. We'll hear about what happened after the flea market in the next post. Ah! You're right! I was thinking of the series of 'All American' Barbie and friends that came with the little Reebok high tops. It must have been the 'tops' that made me think that. The picture of the cat is great, a Blythe version of a cat! I don't know if you know of Radio Flyer over there (In England or Spain. I'll have to ask Ken if they have heard of it in England. ),but it's a very old classic here. They made and are well known for sleds and wagons mostly,all in the classic red white white lettering. When I was little we had a sled and a wagon,both of which are in my basement now.